The advertising is starting at appear for the popular Motatapu Icebreaker. This is a high country marathon race or 50km mountain bike ride that is next held on Saturday March 14th 2009. Last year, this event was sold out iby December. What is so special is that this route is used to be open only one day per year to bike or run through. The race starts at Glendhu Bay, Wanaka and ends in Arrowtown. In March 2008, the Motatapu track was officially opened which is part of the conditions that enabled Shania Twain to buy the property so it is now possible to walk/ride this route any time. 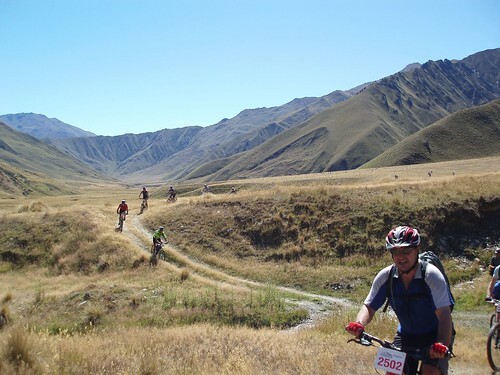 Don’t expect an idyllic solitary mountain biking experience as this is New Zealand’s largest off road mountain bike and 3rd largest marathon race and had approx 2,000 entrants. So if you are thinking of coming to Wanaka around this weekend book your accommodation well in advance . For those not fit enough to compete in the event, the organisers needs plenty of volunteers to help the contestants along the way. And if you think you are going to spot Shania on the porch, the ride goes past Shania Twain’s house but you can’t see it from the path.